I’ve been a captain for Greenpeace for 35 years, fighting for our environment in every corner of the globe. I’ve confronted polluters, poachers, smugglers, terrorists, criminals – both private and corporate – armies, navies, vigilantes and you-name-it. I’ve been arrested, jailed, had my ships chased, shot at, boarded and attacked, and had French commandos bomb and sink my ship under my feet – killing a crew-mate in the process. 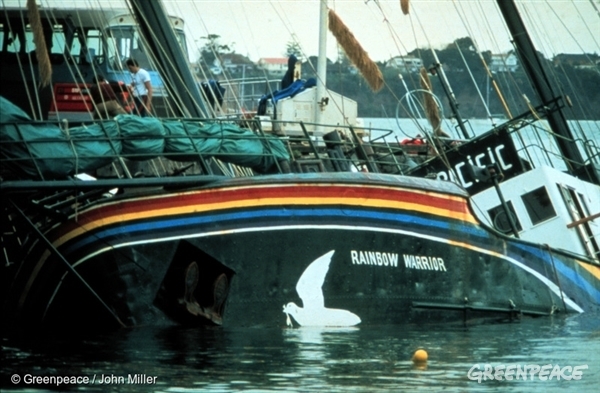 On July 10, 1985 the Rainbow Warrior was bombed by the “action” branch of the French foreign intelligence services. The Greenpeace ship was in the port of Auckland, New Zealand on its way to a protest against a planned French nuclear test in Moruroa. Photographer Fernando Pereira drowned on the sinking ship. Wherever I go, people ask me why I continue to take the risks that I take in defending the Earth. For me, the answer is simple: I care about what our planet will be like in the future. Not in the distant future, but the very-near-term-future in which my daughters Anita and Natasha (ages 24 and 20) will be living while raising their own children. Many environmental activist organisations like Greenpeace, are very much involved in stopping human suffering caused by pollution, slavery, nuclear radiation, toxic waste and climate change. In more than 400,000 miles of sailing for Greenpeace, I have seen the human cost of environmental destruction in every corner of the planet. The Arctic Sunrise, photographed above from a helicopter, moored to an ice floe by stakes hammered into the ice. Tiny figures can be seen working on the floe, drilling holes into the ice. The Arctic Sunrise is one of three Greenpeace ships seeking to bring attention to the effect of climate change and Save the Arctic. In 1985, I brought the Rainbow Warrior to Rongelap Atoll, in the Marshall Islands/South Pacific, to evacuate an entire town to another island because their home island had been poisoned by the fallout from a US thermonuclear/hydrogen bomb. The US knew the islanders were going to be in the fallout zone, and deliberately left them there as human guinea pigs to study the effects of radiation on real people. For three decades these gentle people had suffered through birth defects, jelly-fish babies (born without spines or bones, and with strangely coloured skin), cancer and just plain-old neglect. Greenpeace brought them to a clean island where they could rebuild their lives. Now, 30 years later, these same islands are being drowned – literally – by rising seas. An elderly Rongelapese villager being brought aboard the Rainbow Warrior. For nearly three decades the island had been intentionally subjected to US hydrogen bomb testing. Greenpeace helped to move the entire village to a new island so they could rebuild their lives and culture. We think about saving endangered species like the snail darter, spotted owl, or the blue whale. But what about the endangered people of Rongelap? All the other low-lying atolls in the Pacific? The millions of people around the world whose lives will be destroyed if the sea levels rise just a little bit more. Coastal zones around the world have three-times the population density compared to the rest, and almost one-quarter of the world’s population in these near-coastal zones. That’s more than a billion human beings. These people are just as endangered in the same way birds and fish are. We are destroying their natural habitat and it’s our natural habitat too. We don’t live in a bubble that is separate from the environment (although if we keep fouling our air and water, things might come to that). We are destroying and using up our environment and we are, and will continue to be, affected by it. Most animal species avoid fouling their own nests. It’s a primal instinct. But somehow humankind – supposedly the smartest of all Earth’s species – has lost that instinct. We are destroying our own habitat. A young girl in the fishing village Te O Ni Beeki on Tarawa Island, Kiribati. The Pacific island nation is considered one of the least developed and poorest countries in the world, with their livelihood and survival challenged from the threats of climate change and overfishing. Another human cost of environmental destruction is slavery. In the Amazon, thousands of slaves are being forced to deforest their own land for illegal grazing and logging. The pesticides used for farming on the cleared land flow into the rivers that are used for drinking and bathing for hundreds of miles downstream. Another instance of the human toll I’ve seen is Liberian stowaways hiding in shipments of illegally logged old-growth African forest, and heard eyewitness accounts of similar refugees who jumped off the ships with their hands tied behind their backs, committing suicide rather than be returned to the forced labor lumber camps. The Munduruku people have inhabited the Sawré Muybu in the heart of the Amazon, for generations. But the Brazilian government currently plan to build a series of dams in the Tapajos River basin, which would severely threaten their way of life. In the Philippines, I witnessed the suffering of hundreds of families being poisoned by the PCB’s, dioxins, heavy metals, solvents and waste oil that the US military had left behind on their old bases. One beautiful little six-year-old girl in Manila, Crizel Valencia, had terminal leukemia caused by the toxic materials. This creative and determined girl had painted many of the graphics that we used in the campaign to get the US military to acknowledge their responsibility and clean up the mess. (Sadly, this still has not happened). During her tour of the second Rainbow Warrior (the first was the ship blown up by the French government), Crizel died in the ship’s infirmary, and I saw her mother carrying her off the ship in tears. Seeing that strengthened our resolve to carry on fighting for our environment. Crizel Valencia on wheel of a Greenpeace inflatable boat, living out her wish to be on the Rainbow Warrior. To her left is Greenpeace Captain, Peter Willcox. An analogy I like to use about our planet is that we’re all on one boat, and with more than 7 billion people on it, it’s actually a pretty small boat. As we drill holes into the bottom of the boat we’re all living on, the water is rising. And yet we keep on drilling holes, faster and faster, ignoring the fact that the water is lapping at our knees. How much longer can we continue to ignore that what we are doing to our planet is affecting us all? Saving the whales, the forests and the atmosphere is great, no question. One of the main reasons that environmentalists and activists do what they do is that we are trying to save us from ourselves. When boats are in mortal danger, they send out an S.O.S. call. Our ship, Planet Earth, and the passengers on it are in mortal danger so I’m sending out a different S.O.S. signal: “Save Our Selves.” Only we can rescue us from ourselves so I hope we get the message. Peter Willcox is the author of Greenpeace Captain: My Adventures in Protecting the Future of Our Planet with Ronald B. Weiss, published by Thomas Dunne Books. He has been a captain for Greenpeace for more than 30 years and has led the most compelling and dangerous Greenpeace actions to bring international attention to the destruction of our environment.